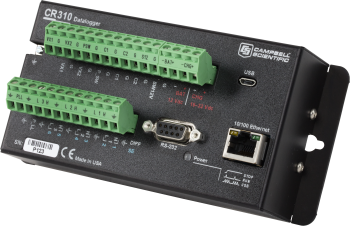 LOGAN, UTAH — Campbell Scientific, a maker of research-grade measurement instruments for over 40 years, is releasing an innovative new data-acquisition product: the CR310 measurement and control datalogger. The CR310 is the newest addition to the CR300 series and has the same capabilities of the CR300 datalogger, with the addition of removable connectors and an integrated 10/100 Ethernet connection. The CR310 includes an integrated Ethernet interface, making it ideal for machine-to-machine (M2M) and Internet-of-things (IoT) applications requiring internet-connected remote monitoring and control. Simple connection to external wireless devices enables remote communication with satellite, cellular, and licensed radios. The CR310 is also available with optional integrated Wi-Fi and license free radios for wireless networking. Providing complete compatibility with a variety of measurement and communication protocols, the CR310 supports TCP/IP, Modbus, DNP3, SDI-12, HTTP, FTP, and Email. The CR310 has the greatest cost-to-performance ratio of any Campbell Scientific dataloggers. For increased analog measurement accuracy and resolution, it has a 24-bit analog to digital converter, and high-speed processor. With 30MB, there is plenty of non-volatile flash memory for storage.